Gas prices are spiking in the Southeast because of a broken pipeline -- and some drivers are having trouble finding gas at all. 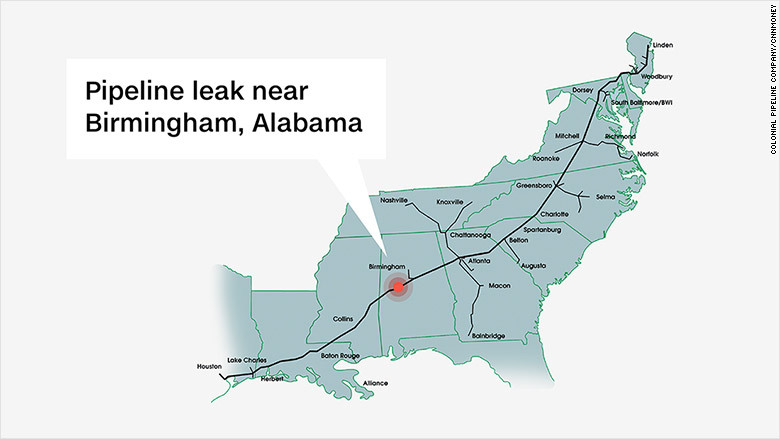 A leak earlier this month in Alabama forced the closure of the pipeline, which runs from Houston to New York and carries gas to much of the Southeast and East Coast. Colonial Pipeline said Monday that it expects to finish construction this week on a bypass that will allow it to restore full service. In the meantime, gas is being detoured through an undamaged second line that usually handles diesel and jet fuel. Some service stations in metro Atlanta and north Georgia had run out of gas on Sunday night. At others that still had gas, cars were lined up -- even for premium. Gas prices are up an average of 21 cents in Georgia and 13 cents in Tennessee since last weekend, according to AAA. Drivers are paying an average of $2.32 in Georgia and $2.13 in Tennessee. Some drivers spotted even bigger price hikes. Bryan Jones, 48, a finance director from Berkeley Lake, Georgia, snapped a picture of a station on his morning commute that was charging $2.99 for regular grade gas. "This was a good 30 cents higher than I saw anywhere else yesterday and this morning," Jones told CNNMoney. "Even yesterday, prices were probably around $2.50." Georgia's governor, Nathan Deal, warned Monday that he would crack down on price-gougers. But drivers still paid more: For Jones, it cost about $47 to fill up his 2016 Nissan Maxima with premium fuel. Jones said he considered working from home Monday instead of driving the 25 minutes to his office in the Atlanta area, but decided against it. Jones said the prices and shortages -- he's seen a few stations shut down -- led him to buy gas earlier than usual this week. Now he said he'll think twice before deciding whether he needs to use his car. "I'll be more careful," Jones said, "just kind of depending on when they get things fixed and when service gets back to normal." Some drivers spent their morning hunting for gas with little success. 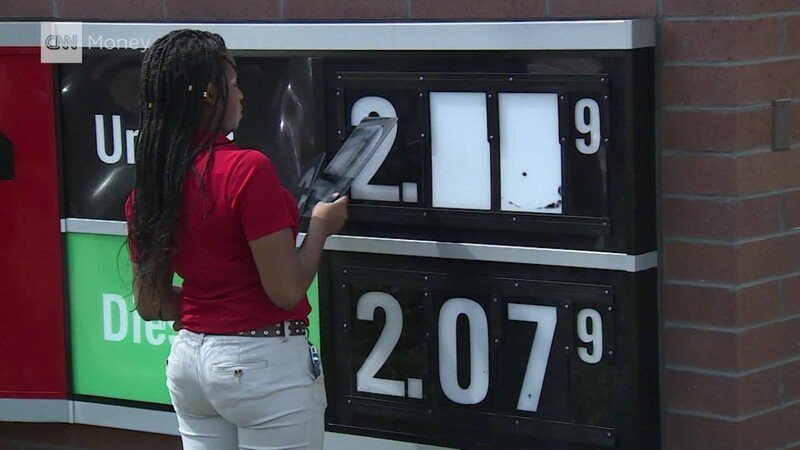 Marcus Golphin had hoped he'd find fuel at a Chevron in Atlanta. But by the time he pulled his car into the station, the pumps had run dry. "There's no gas, and I'm about to run out of gas," Golphin told CNN. He said he'd been to about 10 stations in a 5-mile radius without luck. Jeremy Johnson said he wanted to hit a station before delivering packages. The Chevron was his latest failed attempt. "I have no gas at all," Johnson said. "It's slowing me down. I'm basically missing work." Six states across the region -- Alabama, Georgia, North Carolina, South Carolina, Tennessee and Virginia -- have declared emergencies and relaxed restrictions on fuel transportation to stave off shortages and price spikes. In Georgia, authorities didn't have details Sunday about how widespread the shortage issues were. The governor's office didn't immediately return a request for comment Monday. But the problems so far don't appear severe. In North Carolina, the Department of Public Safety said the state had "spotty" shortages. Similar problems were reported in parts of Tennessee. And authorities in South Carolina said they had heard of "isolated cases" of gas stations running out of fuel. 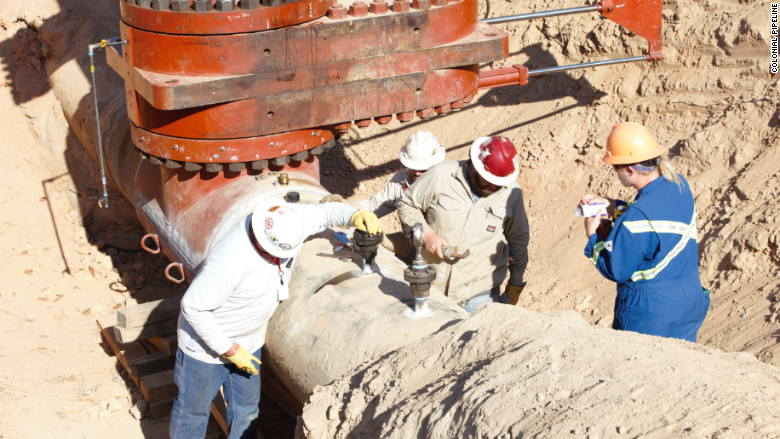 A section of the pipeline has been closed since Sept. 9 after a spill of roughly 250,000 gallons was discovered. The pipeline provides gasoline for an estimated 50 million people on the East Coast each day, according to company estimates. The cause of the leak has yet to be determined. The closure has set off an industry-wide scramble as suppliers seek alternative ways to transport gasoline to the East Coast. -- Richard Griffiths, Jethro Mullen, Charles Riley, Faith Robinson and Joe Sutton contributed to this report.